Result: Lukas Lacko defeated Marco Cecchinato by 6-3, 6-4. It was an eye catching performance between Lukas Lacko and Marco Cecchinato as they both gave a very brilliant performance. The Slovak play, Lukas Lacko took a perfect start by opening the scoring of the first set with a powerful shot. On the other hand, Marco Cecchinato was struggling hard to score points. However, the set eventually came to an end and Lukas Lacko sealed his victory in the first set by three points upfront. It was a shocking defeat for the Italian player as he could lost the semi final if he loses the next set. The second set started after a short break and this time Marco Cecchinato took the lead. However, both the players were scoring points at a very fast pace and the match became more exciting when the score was equalized 4-4. 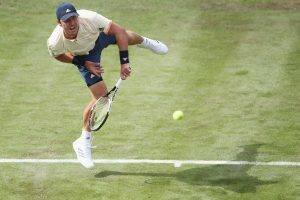 At last, it was Marco Cecchinato who lost the last two points in a quick succession and failed to reach the finals of Eastbourne Tennis Intl 2018. Lukas Lacko in terms of talent is more than good enough to win ATP title,everything else is just not as it should-bad attitude on court,zero will for a big fight(probably not training enough so he isn’t in a great shape),but better him than Cecchinato in a grass final. Lukas Lacko finally made it to the finals where he will play against Mischa Zverev at Eastbourne Tennis Intl 2018. We have our 1⃣st @ATPWorldTour Finalist as Lukas Lacko beats No.4 seed Cecchinato 6-3, 6-4! Result: Mischa Zverev defeated Mikhail Kukushkin in Eastbourne Tennis Intl 2018 by 7-6(9), 6-4. The German, Mischa Zverev took the lead in the opening set of the match and was scoring points quickly. On the other hand, Mikhail Kukushkin was also playing confidently and was recovering the lead. After a tough fight between the two, the set eventually came to a tie-breaker as the score was equalized 6-6. At last, Mischa Zverev won the set on the tie-break as Mikhail Kukushkin dropped a total of three points on his serve. * First-time @ATPWorldTour champion will be crowned. * @LukiLacko playing in 2nd final (also 2012 Zagreb). The match moved on to the second set and this time the Kazakhstan player, Mikhail Kukushkin opened the scoring of this set. A resilient battle was witnessed between the two players again as the score became levelled at 4-4. In the end, Mischa Zverev scored the last two points in a quick succession and won the second set too. Mischa Zverev has now advanced to the finals of Eastbourne Tennis Intl 2018 where he will face Lukas Lacko. If Mischa Zverev wins #NatureValleyInternational final on Saturday, he and Sascha Zverev will become 1st brothers to own @ATPWorldTour singles titles since John and @PatrickMcEnroe. P-Mac captured 1995 @SydneyTennis title to join big brother John, who won 77 titles from 1978-91. Result: Caroline Wozniacki defeated Angelique Kerber by 2-6, 7-6(4), 6-4. An absolute and breathtaking performance was witnessed by Caroline Wozniacki and the German star player, Angelique Kerber in all the three sets. The 30-years old, Angelique Kerber looked on fire as she was playing very confidently and was scoring points at a very fast pace. In the end, Caroline Wozniacki failed to win the first set as she lost many points on her serve. The next set started with Angelique Kerber leading by one set. However, Caroline Wozniacki again took the lead in the second set. However, after a tough fight between the two, the set eventually came to a tie-breaker as the score were levelled at 6-6. In the tie-break, Angelique Kerber got into pressure and lost a total of four serves which costed her the second set. Now it was all down to the third and decisive set of the match for both of them. Wozniacki saves MP to force a 3rd set, then saves BP in the final game to close out Kerber. 1st final since the Australian Open. Although, Angelique Kerber opened the scoring but Caroline Wozniacki was also scoring points quickly. After a resilient battle, the Danish player, Caroline Wozniacki claimed the victory in the decisive set and made it to the finals. What a comeback from @CaroWozniacki to book her place in the #NatureValleyInternational final! Although, Caroline Wozniacki made three double faults as compared to Angelique Kerber who made only two, but still the German faced defeat in the last two sets. Caroline Wozniacki will now face Aryna Sabalenka in the finals of Eastbourne Tennis Intl 2018. Result: Aryna Sabalenka defeated Agnieszka Radwanska by 6-3, 1-6, 6-3. What an absolute and exquisite performance was witnessed today between Aryna Sabalenka and Agnieszka Radwanska throughout the match. The Polish professional, Agnieszka Radwanska opened the scoring of the first set but failed to extend it large enough for her opponent. While on the other hand, Aryna Sabalenka was scoring points at a very fast pace. However, both the players were also losing points on their serve one after the other. In the end of the first set, it was Aryna Sabalenka who sealed her win by leading three points upfront. Despite a bad performance from Aryna Sabalenka in the first set, still she managed to win somehow. The next started after some time and this time Aryna Sabalenka opened the scoring when Agnieszka Radwanska failed to score on her serve. It was an exciting set to watch as Aryna Sabalenka was constantly losing points to Agnieszka Radwanska. At last, Aryna Sabalenka failed to claim the victory in this set as she lost a total of three serves in it. Now it was all down to the third set of the match which was a decisive one for both the players. The Belarus player, Aryna Sabalenka took the lead in this set as she looked confident while playing. However, on the other hand, Agnieszka Radwanska was also scoring points but at a very slow pace. In the end, it was the Belarus tar, Aryna Sabalenka who sealed her win in this set with three points upfront. Although, Agnieszka Radwanska made zero double faults in the whole match as compared to Aryna Sabalenka who made a total of six double faults, but still she lost it in the end. Now Aryna Sabalenka will face the Danish star, Caroline Wozniacki in the final of Eastbourne Tennis Intl 2018. Result: Luke Bambridge and Jonny O’Mara defeated Neal Skupski and Ken Skupski in Eastbourne Tennis Intl 2018 by 7-5, 6-4. Although, Neal Skupski and Ken Skupski opened the scoring of the first set but they were not playing confidently. On the other hand, Luke Bambridge and Jonny O’Mara were down to three points after some time as they were dropping points on their serve. However, after a tough fight, the score reached 5-5. But eventually, it was Luke Bambridge and Jonny O’Mara who sealed their win in the first by scoring the last two points in a quick succession. 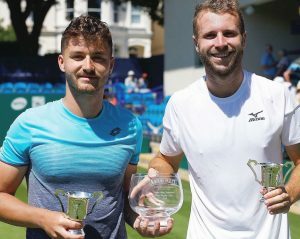 Luke Bambridge and Jonny O’Mara won the all-British final in Eastbourne against Ken and Neale Skupski. Who knows what else they will do in their careers, but no matter what that’s an achievement – beating the top seeds along the way. Good for them. In the next set, Neal Skupski and Ken Skupski again took the lead after a beautiful drop shot was played by Neal Skupski. However, again a resilient battle was witnessed between the British pairs as the score reached 4-3 with Luke Bambridge and Jonny O’Mara leading. At last, Luke Bambridge and Jonny O’Mara finished the second set by scoring the last two points in a quick succession. It was a great win for both the British players as they both lost the first round of Eastbourne Tennis Intl in 2017. Result: Irina-Camelia Begu and Mihaela Buzarnescu defeated Ekaterina Makarova and Nadiia Kichenok in Eastbourne Tennis Intl 2018 by 4-6, 6-0, 10-6. But in the end, Ekaterina Makarova and Nadiia Kichenok claimed their win in the firsts set when Irina-Camelia Begu and Mihaela Buzarnescu failed to score the last two points first. In the second set, Irina-Camelia Begu and Mihaela Buzarnescu showed an absolute and dazzling performance. They both not only took the lead but were constantly scoring points, while on the other hand, Ekaterina Makarova and Nadiia Kichenok were losing points on their serve. In the end, Ekaterina Makarova and Nadiia Kichenok faced a humiliating defeat in the second set as they both were not able to score a single point in throughout the set. Irina-Camelia #Begu și #MihaelaBuzarnescu sunt în finala de dublu de la #Eastbourne! #IrinaBegu și Mihaela #Buzărnescu în semifinalele probei de dublu au învins cu 4-6, 6-0, 10-6 în meciul cu N. Kichenok (UKR)/ E. Makarova (RUS). Now it was all down to the third set of the match for both the pairs. Ekaterina Makarova and Nadiia Kichenok took the lead in the third set as Irina-Camelia Begu and Mihaela Buzarnescu dropped the first point on their serve. Both the pairs were playing confidently but in the end, Irina-Camelia Begu and Mihaela Buzarnescu won it as Ekaterina Makarova and Nadiia Kichenok both dropped a total of five points on their serve. Irina-Camelia Begu and Mihaela Buzarnescu will now face Gabriela Dabrowski and Xu Yifan in the finals of Eastbourne Tennis Intl 2018. Result: Gabriela Dabrowski and Xu Yifan defeated Aryna Sabalenka and Hsieh Su-wei in Eastbourne Tennis Intl 2018 by 6-7(4), 7-5, 13-11. Gabriela Dabrowski and Xu Yifan opened the scoring of the first set and were scoring points quickly. While on the other hand, Aryna Sabalenka and Hsieh Su-wei were also gaining points at a very fast pace. At last, the set came to a tie-breaker after the score was levelled at 6-6. Get it, Gaby 🙌@GabyDabrowski and Xu Yifan score a spectacular 6-7(4), 7-5, [13-11] win over Hsieh/Sabalenka to reach the finals of the #NatureValleyInternational. However, Aryna Sabalenka and Hsieh Su-wei secured their win on the tie-break as Gabriela Dabrowski and Xu Yifan lost a total of four points on their serve. In the second set, Aryna Sabalenka and Hsieh Su-wei opened the scoring this time. Both the pairs were performing very well as the score reached 5-5. In the end, Gabriela Dabrowski and Xu Yifan claimed the victory in this set and the match moved on to the deciding set. An exquisite performance was seen by both the pairs as they both were scoring points immediately after they lost a point. After a hard fought battle, Gabriela Dabrowski and Xu Yifan finally won in the end and made it to the finals. Gabriela Dabrowski and Xu Yifan will now face Irina-Camelia Begu and Mihaela Buzarnescu in the final of Eastbourne Tennis Intl 2018.